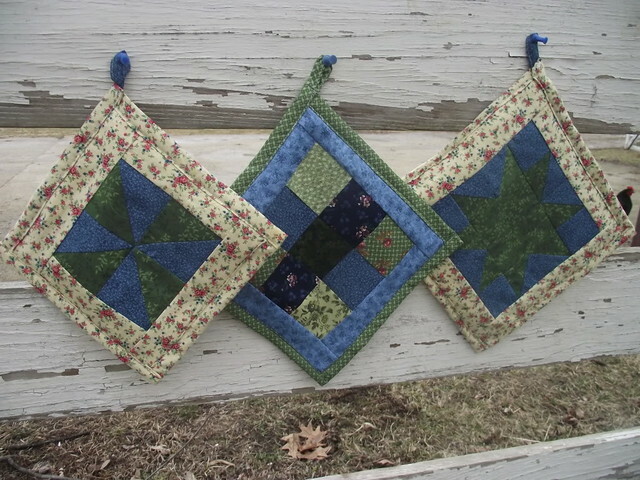 They’re not really quilted, but they are pieced like a quilt. 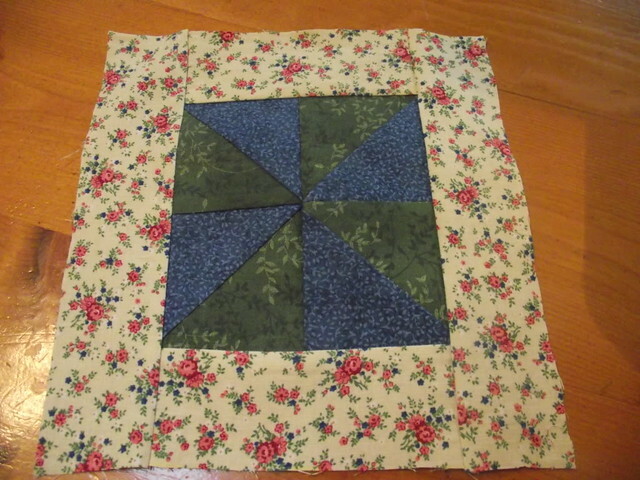 Very cute, fun, and good practice before doing a large quilt. 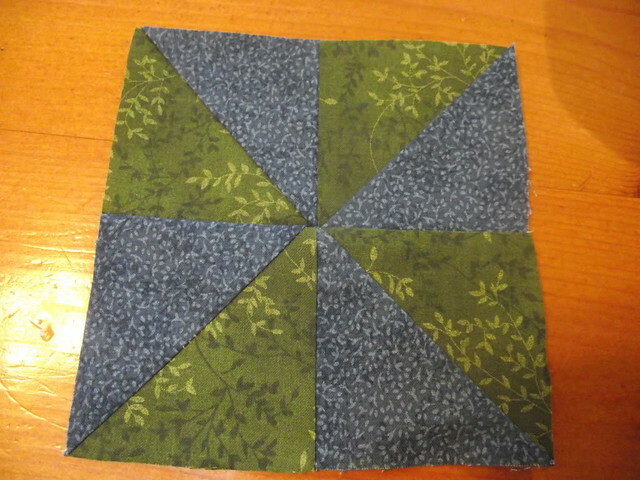 Starting small when doing piecing for the first time is a good idea. 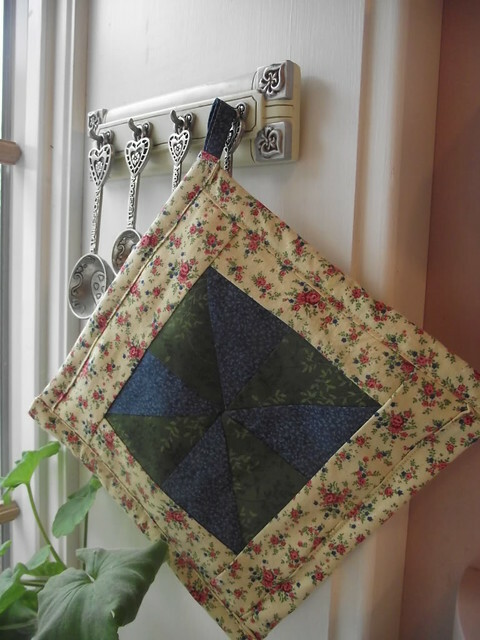 Potholders are a fun and quick craft to start with. 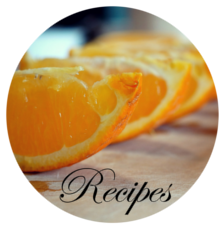 You can make a fun collection for your hopechest, give them as gifts, or use them in your own family’s kitchen. 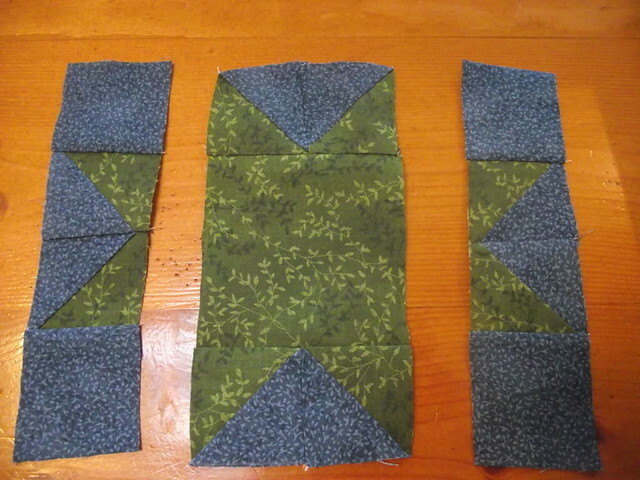 This is a tutorial for three different kinds of pieced quilt blocks made into potholder size. Morning Star, Pinwheel, and Nine Patch. Nine Patch is a good starter. Although the others are not hard to do, even if they do look hard, but the nine patch is simple and square. 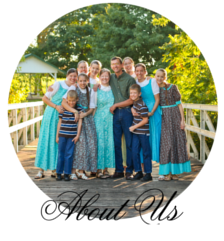 Another fun one that is called Log Cabin can be found at this blog. 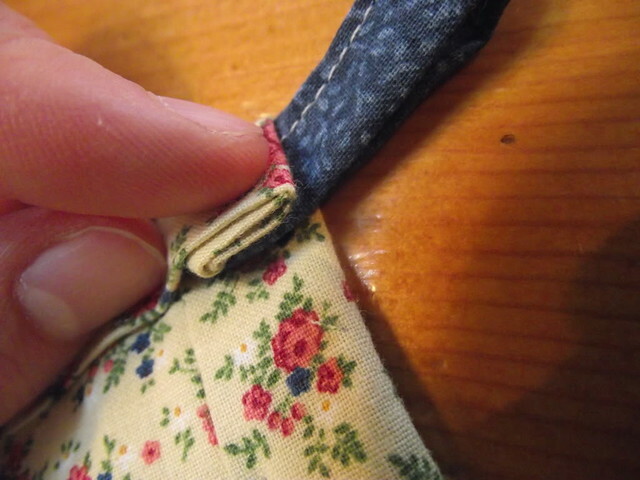 It doesn’t look too hard to do, though I wouldn’t do the binding that way as it is more difficult. You don’t want to use polyester or acrylic fabrics or batting for the “filler” because not only are they not heat resistant, but they also melt when exposed to high heat and when melted can stick to skin, possibly causing a severe burn in the process. Cotton and wool are good fabrics to use, and a bath towel works well for the “filler”. 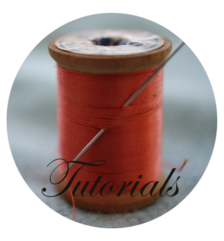 To start with, decide on what fabrics and colors you are going to use. 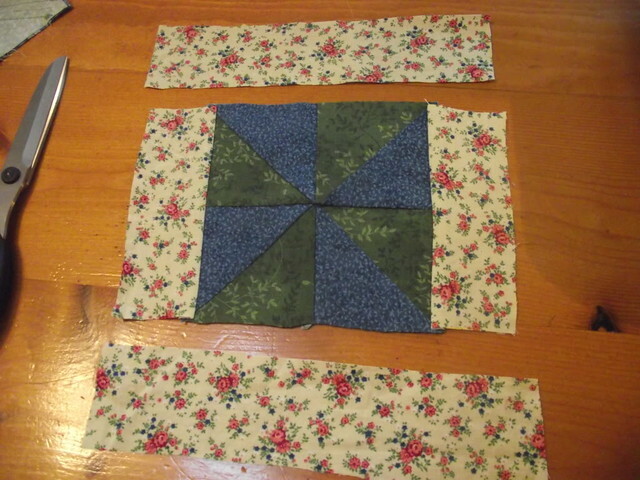 To make the pinwheel potholder(far left in top picture) you will need three coordinating fabrics. 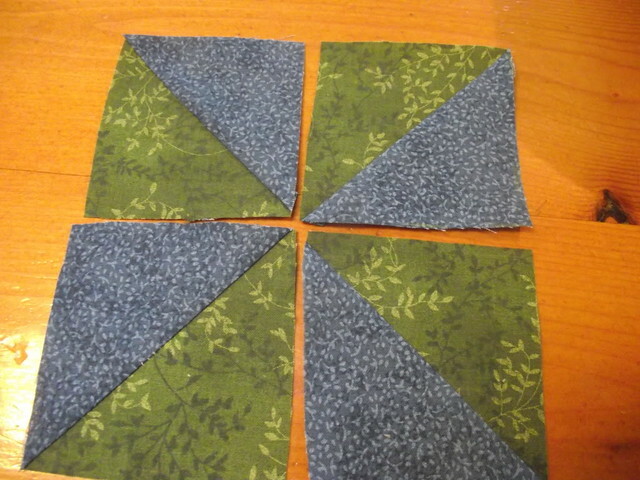 Four squares (green and blue) that measure 3″ X 3″. 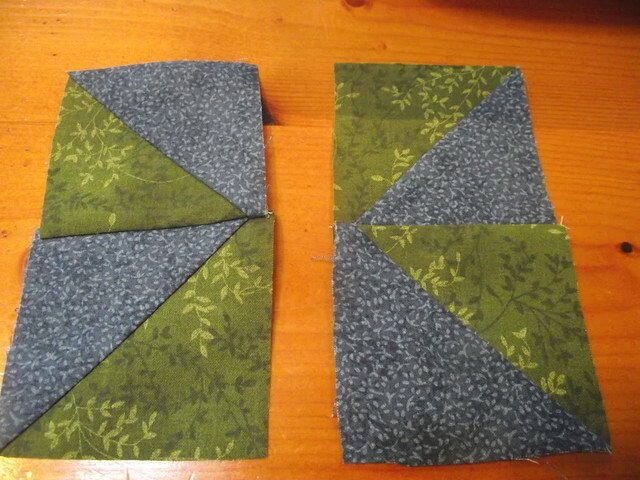 These will make the pinwheel in the middle. Two 4-3/4″ X 1-3/4″ and two 8″ X 1-3/4″ out of a coordinating fabric for your border. One 9″ X 9″ piece of towel. If you are using a thinner towel, you may want two pieces. 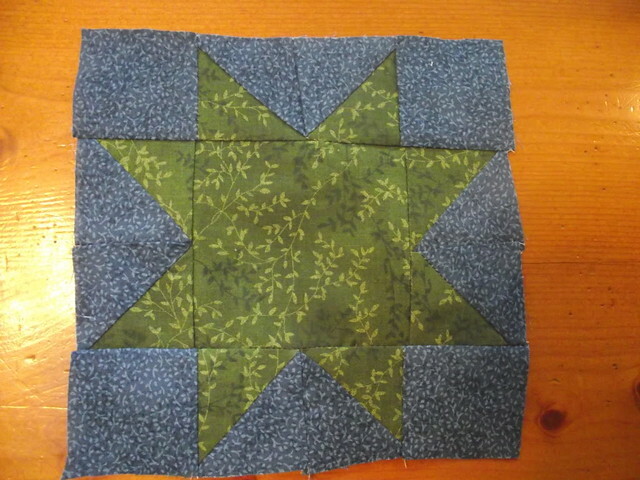 2- On the wrong side of four of the squares (green), make a pencil mark down the middle and lay the green pieces on the the blue pieces right sides together. 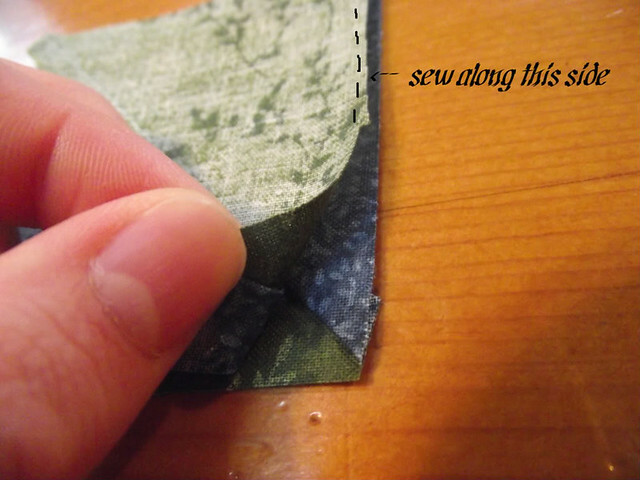 Sew 1/4″ (all seam allowances are 1/4″) down both sides of the mark and then cut down the pencil line. 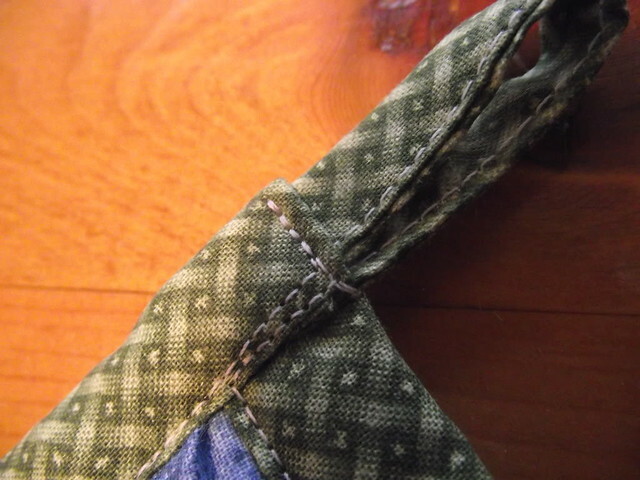 3- Sew the left top and bottom together, matching up the points, and do the same with the right top and bottom. 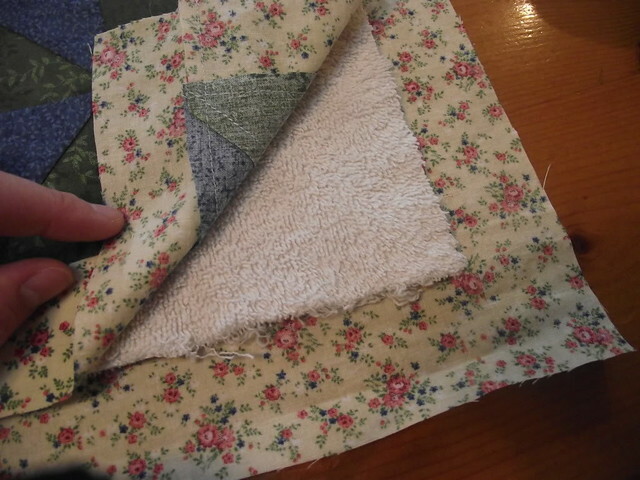 5- Trim the towel piece to be just a bit smaller than your pinwheel piece. 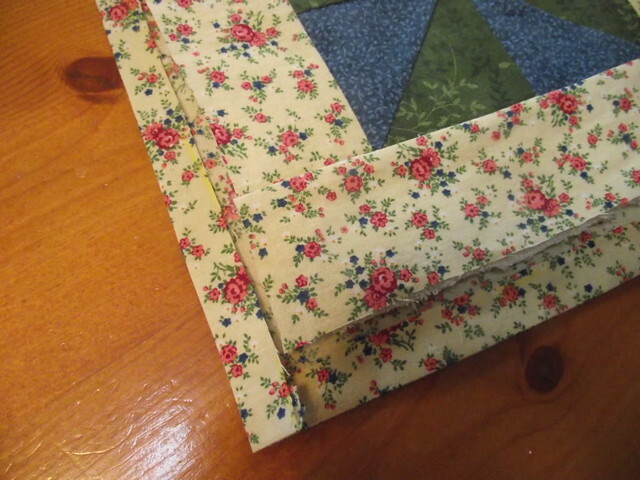 …and fold them in again to create a binding. Pin and sew. Leave one corner open so you can put in your hanging tab later. 8- Make your tab. Fold raw edges in on both long sides, and then in half. Iron and stitch. 9- Fold the tab in half and place raw edges in the unfinished corner. Stitch well. 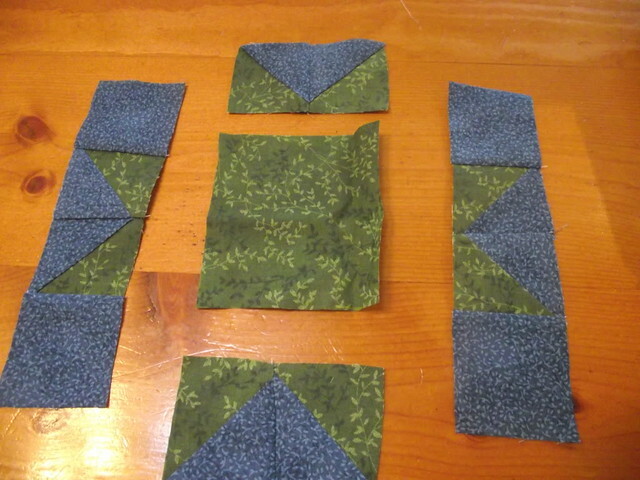 …then sew the middle pieces together. 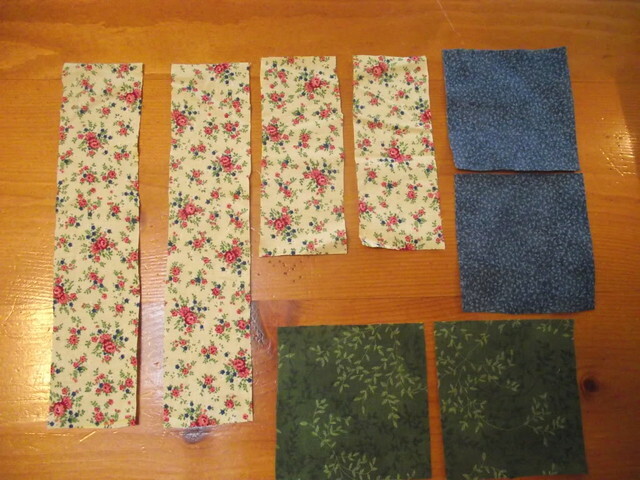 And then sew all three rows together while matching up points and corners. 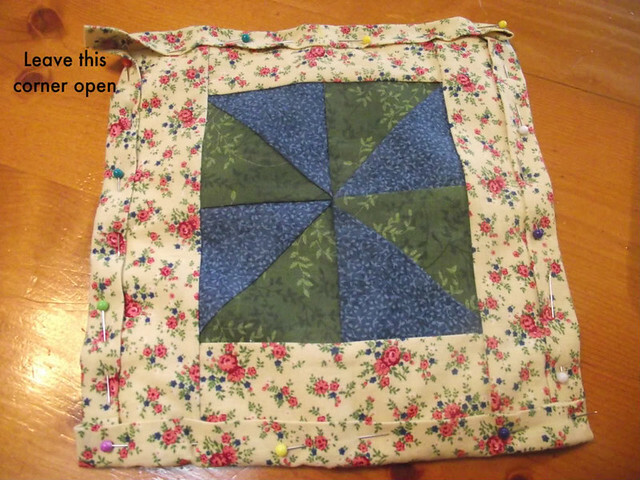 Continue with the borders, backing and binding as you did with the pinwheel potholder in steps 4-9. 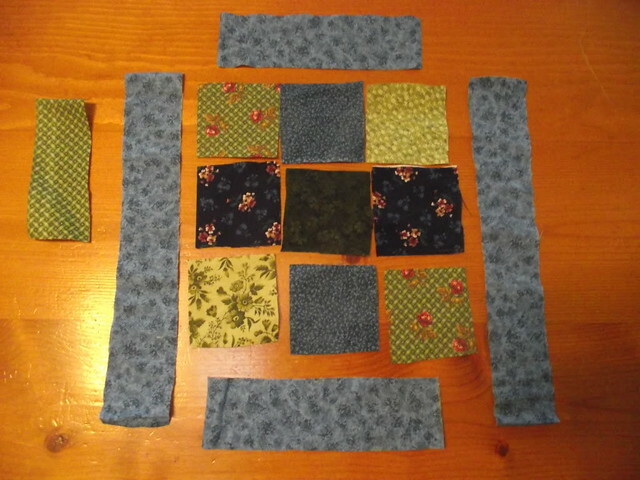 Sew the squares together in vertical rows using 1/4″ seam allowance and then sew the rows together matching up the corners. 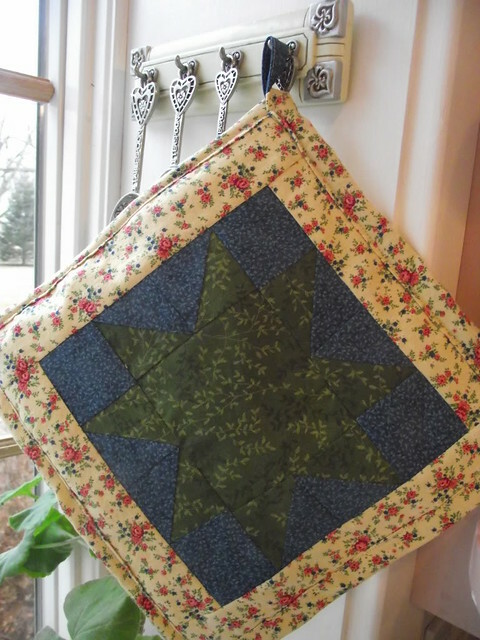 Continue with the border, backing and binding as you did with the pinwheel potholder in steps 4-9. The DVD, Homestead Blessings-The Art of Quilting, is what really got my sisters and I (back) into quilting. The West Ladies make it look so fun and easy. 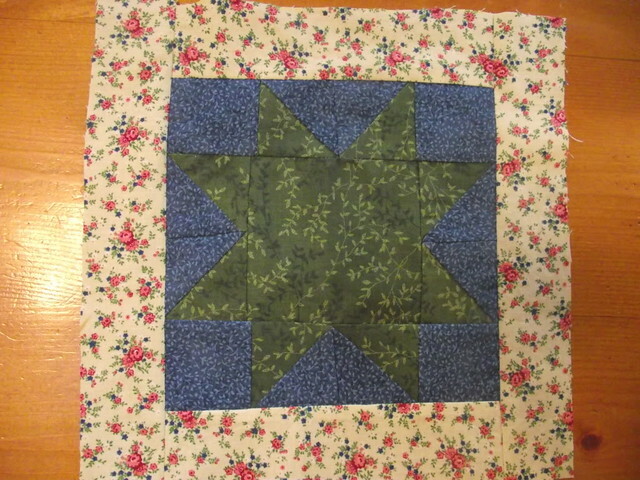 We have started several quilts several years ago, but have never finished them. After watching this, it inspired us to get them back out and work on them. 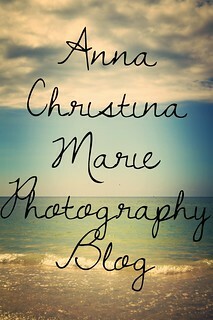 This post was originally posted at Feelin’ Feminine for the ‘A Chest of Hopes’ column. love the potholders…especially the nine patch! 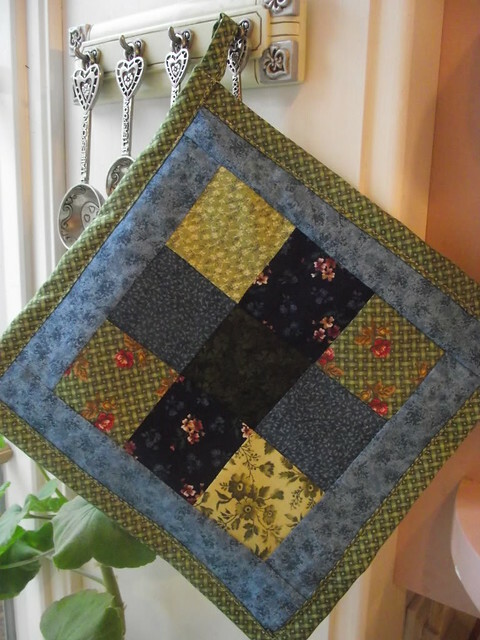 I made the nine patch potholder! 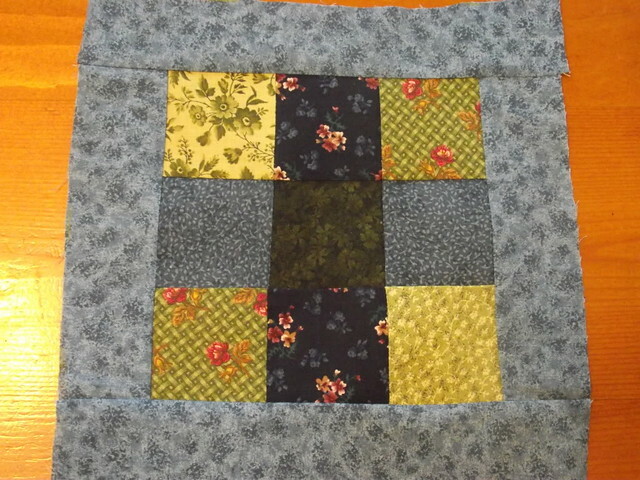 It was my first quilting project ever, and perfect for a beginner since the instructions are clear and easy to follow. The result was very pretty too!